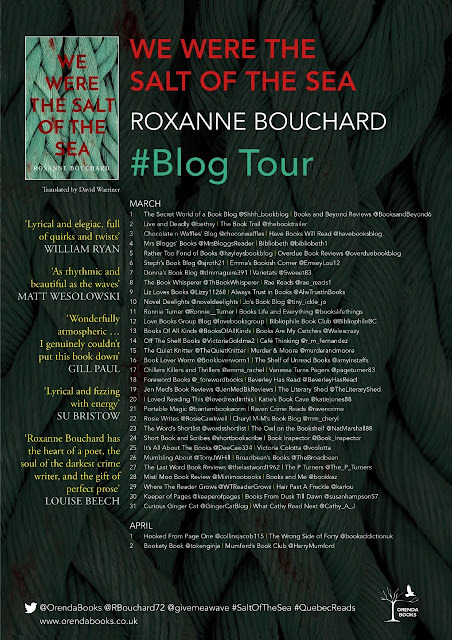 Delighted to be part of this Blog Tour for this stunning book. 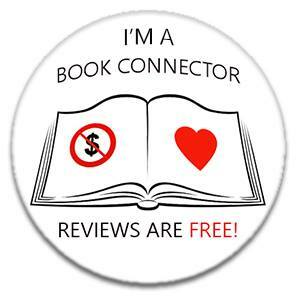 My thanks to the author, Orenda Books and Anne Cater of Random Things Tours for letting me be part of the tour. As Montrealer Catherine Day sets foot in a remote fishing village and starts asking around about her birth mother, the body of a woman dredges up in a fisherman’s nets. Not just any woman, though: Marie Garant, an elusive, nomadic sailor and unbridled beauty who once tied many a man’s heart in knots. Detective Sergeant Joaquin Morales, newly drafted to the area from the suburbs of Montreal, barely has time to unpack his suitcase before he’s thrown into the deep end of the investigation. On Quebec’s outlying Gaspé Peninsula, the truth can be slippery, especially down on the fishermen’s wharves. Interviews drift into idle chit-chat, evidence floats off with the tide and the truth lingers in murky waters. It’s enough to make DS Morales reach straight for a large whisky. Ten years or so ago, Roxanne Bouchard decided it was time she found her sea legs. So she learned to sail, first on the St Lawrence River, before taking to the open waters off the Gaspé Peninsula. The local fishermen soon invited her aboard to reel in their lobster nets, and Roxanne saw for herself that the sunrise over Bonaventure never lies. 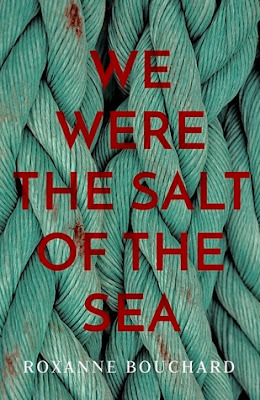 We Were the Salt of the Sea is her fifth novel, and her first to be translated into English. She lives in Quebec. 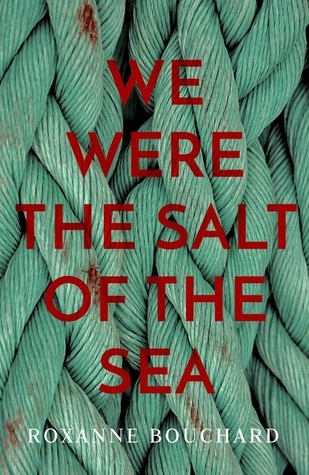 If you are looking for a crime novel that is based around the power of the sea, told in a style that feels like the gentle lapping waves hitting the shore, then look no further! Orenda books have discovered another great talent in Roxanne Bouchard who tells a tale in a beautifully lyrical way and has created an atmospheric and polished debut. Catherine Day is trying to find her roots. She knows nothing of her mother and father, other than a womans' name. And when she shows up in the remote fishing village in the Gaspe Peninsula, her presence starts to ruffle a few feathers and coincides with the body of a woman being found in a fisherman's nets. Marie Garant is the deceased woman and was well known in the village for being an extraordinary woman, a sailor who would disappear for months before returning. She made an impact though on people of the village when she was around and her death finds many rattled. When Joaquin Morales is brought in from Montreal to investigate her death he soon finds himself becoming wrapped up in the ways of the village and finds many villagers reluctant to talk, and is intrigued to find out what they're hiding, and why. He is suffering his own personal problems and this adds extra depth to the story as you feel he finds the investigation a way of trying to ignore what is happening in his own life. There are so many fascinating characters in this story which I found to be compelling as you often don't get the measure of people until tiny little details of their lives are later revealed. 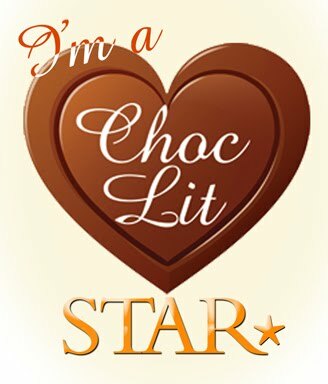 It isn't an action packed story, as the author takes her time over the complexities of a community who thrive on keeping things close to their chests. As Catherine discovers more of the story of her own background it seems to empower her and it was wonderful to see her break free from the chains she had placed around herself for whatever reason.